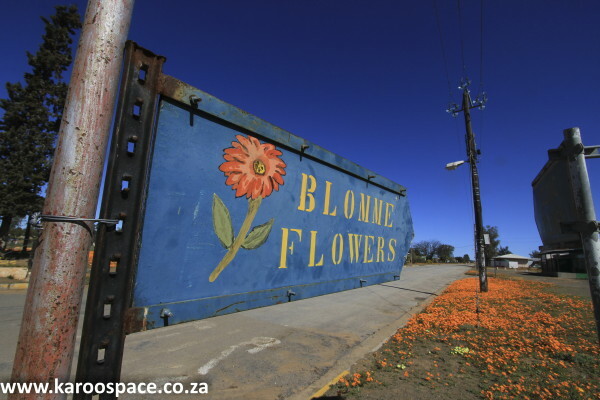 This way to the flowers of Namaqualand – downtown Calvinia. “Where’s the best place in the world to be, at the start of a classic South African springtime? You might opt for the bushveld, somebody else might want to be down in Hermanus and that guy in the corner might well prefer the Drakensberg. 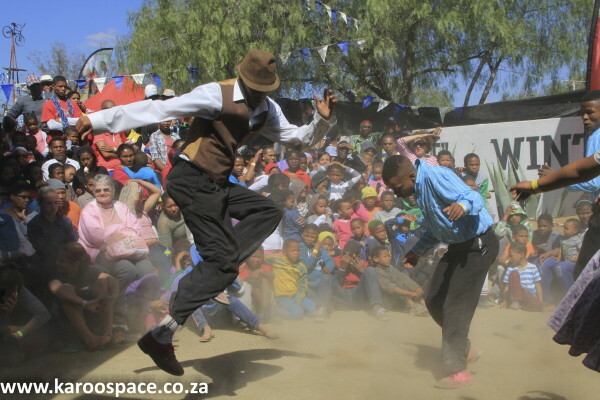 In our books, the spot come September is a certain little town in the Northern Cape. That’s because, like thousands of other ‘flower anoraks’, we like to hunt daisies with cameras in the spring. And southern Namaqualand is where we go looking for them. The problem is, however, that a Namaqua daisy bloom is an unpredictable thing. One day it’s all happening over in Nieuwoudtville, tomorrow it’s the Knersvlakte’s turn to shine. 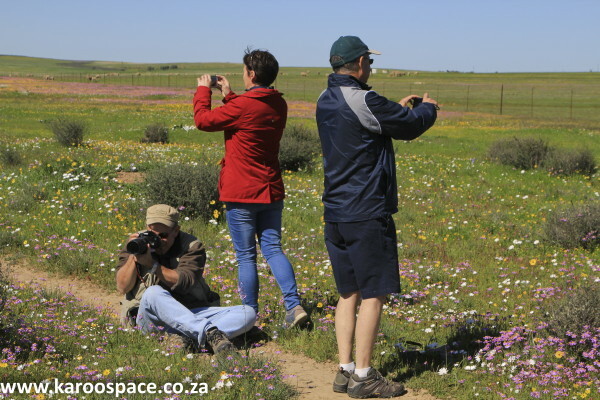 Springtime in Namaqualand – should you actually be anywhere else? You could end up totally confused out here, running about like a headless chicken. But that, you see, is the essential difference between a tourist and a traveller. And we are travellers, no? So what we do is base ourselves somewhere dandy for a week, and venture out each day in a different direction. We always take padkos in case the hotel owner’s gone shopping or the publican’s gone fishing. We phone ahead and find out things. We do some homework on local sights so we know what we’re looking for. We dress for the outdoors and we drive the most rugged set of wheels we own, so the route never daunts. We take the best cameras in the house, with all their lenses and stabilisers and tripods and other accessories. Or we just take cell phones. Whatever’s available. And then we hit the road to Calvinia, the land of red meat, big skies and lots of flowers. We’ve already phoned Alta Coetzee the owner of the Hantam Huise, and booked our little self-cater cottage for the week. Chris M (seated), Alida Schulze and her husband Wally focus on matters at the Hantam National Botanical Gardens outside Nieuwoudtville. That’s the pitch we handed our Cradock neighbours, Walter and Alida Schulze, on a red wine Sunday last winter. And, wonder of wonders, they fell for it. So Jules and I slid into the sleepy town of Calvinia at the beginning of September, just after they’d been chock-a-block busy with their annual meat festival. I could still see people wandering the streets in a protein haze. The Schulze’s would follow later in the day, so we met up with Alta, she gave us keys to our Tuishuis and we opened the place up. It was perfect: two bedrooms, little lounge, dining room and a TV with enough channels to satisfy sports fans in the group. Our neighbours arrived, we lit the fire, burnt meat and planned the week ahead with a large amount of glee and a little merlot. 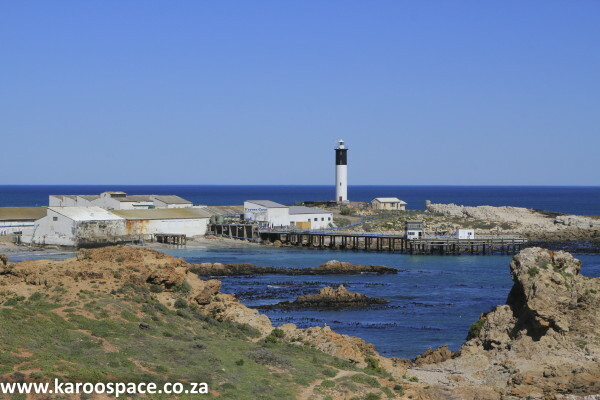 Nieuwoudtville and the legacy of Neil Mcgregor. The next morning we headed west to Nieuwoudtville, where we made a quick stop at the town hall for flower info and then proceeded to the Hantam National Botanical Gardens. This spread was once called Glen Lyon and owned by Neil McGregor, who found a way to combine sheep farming with the conservation of the land’s botanical treasures. Thus he became one of the founding fathers of the seasonal Namaqualand Flower Tourism Route. And flower tourists are, we think, the finest kind of tourists around. We peeled out of Walter’s SUV with cameras in hand, and began to stalk around the place looking, one suspects, a little silly. But we were in the company of about 120 other daisy-chasers who appeared equally clownish, so no one seemed to give a damn. 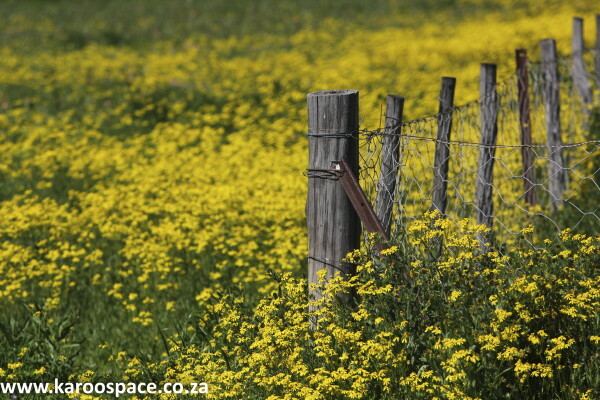 Apart from all the macro work, the sight of the morning was an old fence line deliciously smothered with yellow daisies. “Neil would have loved seeing us wandering about his farm like this,” said Jules. Because of what he’d done and because of his lovely nature, Jules holds a soft spot for the late Namaqualand farmer. We tore ourselves away from this excellent place and headed north to Loeriesfontein. Jules and I have been here countless times, but the Schulze’s hadn’t. That made it special for us. 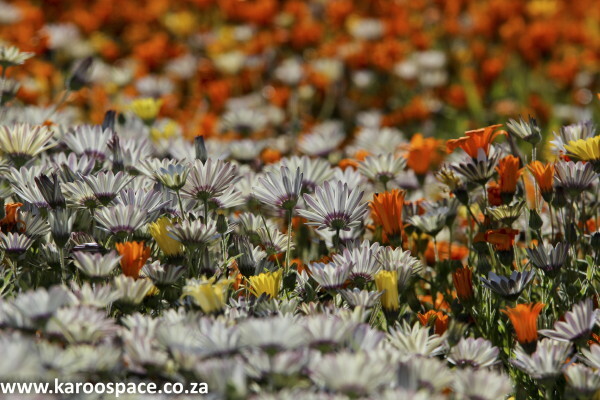 A whole field of steel flowers – in Loeriesfontein. On the way, we stopped at a hill that was covered in quiver trees. Two things about a koker (quiver): if you’re standing in the middle of such a forest, it might appear as if you’re on parade with Chinese terracotta warriors. And sometimes it feels like one of them just moved behind you. Secondly, try to get under a quiver tree with your wide-angle lens and shoot out from the shade. You’ll get some unusual backlight effects. Jules is the Quiver Tree Photo Queen, and this is one of her tricks. 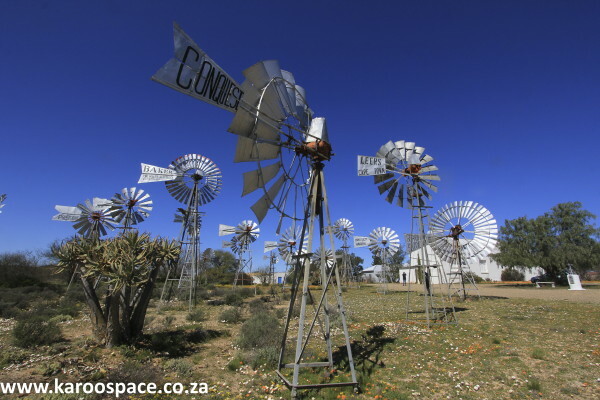 We finished playing in the forest, jumped back into the vehicle and drove on to the Fred Turner Wind Pump Museum in Loeriesfontein, where Vetsak President, Star Dunnell, Defiance Butler, Gearing Self-Oiled and a whole bunch of other old friends were waiting. 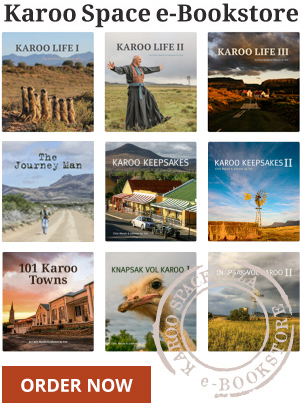 Although it was a fearsome photo session, the lunchtime aromas of the nearby kookskerm (outdoor cooking area) drew us away from the creaking old Steel Wheels of the Karoo. We wolfed down a pile of chicken-stuffed pancakes (creamy, with just a hint of chilli), wandered about the Trekboer Museum and took a slow drive back to our spot in Calvinia. 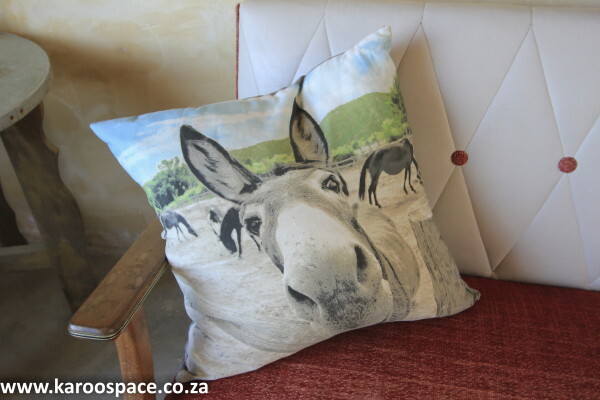 The Tankwa Padstal people are crazy about donkeys. We’d been bushed the night before, so no party. Also, no headache, which meant that today’s drive south along the R355 to our beloved Tankwa Padstal would be a painless affair. Jules and I were wondering what the flowers would be like on this route. We were also wondering what Walter and Alida would think of the outlaw eccentrics who sometimes gather at the Tankwa Padstal. During the slow 120km drive, we saw one Council for Geosciences bakkie, two ostriches, three flocks of sheep, one random collection of goats and a few zillion flowers. And, of course, a world of stones. Today, we were travelling in the Karoo Space bakkie. The conversation drifted this way and that. We discovered that, if Walter and Alida used the method of ‘first pet name’ combined with ‘first street lived in’, she would be Snippy Aandblom and he would be Tiekie Louis Botha. I would be Wollie Crot and Jules would be Heidi Townshend. I’m just saying. Jules gets her animal fix at the Tankwa Padstal. We finally pulled in at the legendary padstal, just behind two donkey carts driven by local farm workers. Wally Lange was behind the bar. Wally, meet Walter and Alida. It was great to see that the bar (rebuilt since the last padstal was burned down) still displayed its infamous braai griddle filled with dolls, appropriately named Barbie-Q. A group of farmers from Wepener up in the Free State came in for a beer. The Schulze’s fell into a deep conversation with them almost immediately. Turns out Walter had attended his Matric dance with a mutual friend. A Karoo connection out here in the middle of nowhere. We had to prise our fellow travellers out of the famous desert oasis, which they seemed to love almost instantly. “So if they were OK with the Tankwa Padstal, do you think they’d be OK with the Republic of Rustica tonight?” I asked Jules. She just grinned at me and nodded. 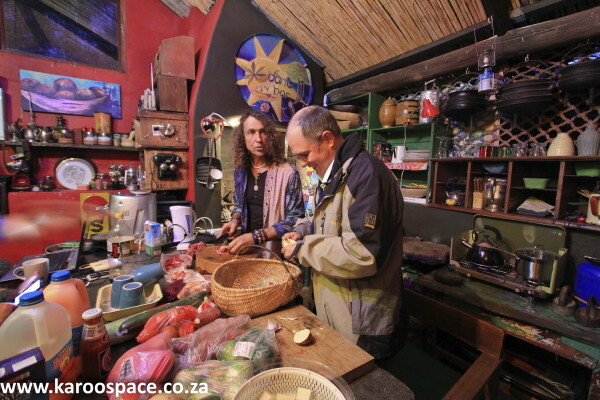 Wally Schulze and Dirk van Rensburg become dab hands in the kitchen at the Republic of Rustica in Calvinia. Dirk and Sonja van Rensburg are part of a wonderfully fearsome breed of Afrikaner hippies with open minds, a sense of humour and a welcome for everyone. Oh, and their little b&b setup is stacked to the rafters with Dirk’s rusty collectibles. Well, he collects them. Let’s put it that way. He first had to show us his latest acquisition, an old Lister engine standing on the sidewalk outside their bakery. After a few cranks and curses, it sprang to life in a cloud of blue smoke. Then Ferdinand Rabie, who once won Big Brother, arrived in a minibus with tour guests and they whistle-stopped through. Inside the Van Rensburgs’ Don’t Cry Bar sat comedian Casper de Vries with members of a film crew. Somehow, the subject of the funny name-thing we had discussed earlier came up. “Oh, then my name would be Sagryntjie Krul,” said Casper. Walter and Dirk set about cutting up a mountain of vegetables for the evening potjie, Sonja tried to get us all to paint something together, there was very good rock music on offer and eventually we all sat down for a very late dinner. And a touch of merlot. The perfect springday at the perfect setting – Doring Bay. “I want to see the sea,” was Walter’s request for the following day’s travels. So we drove west once more through Nieuwoudtville, which was alive with golden katsterte (yellow bulbines). We’d been advised to stop at the Baghdad Café outside Vanrhysdorp en route to the seafood delights of Doring Bay, but it turned out they were all busy preparing for their annual church bazaar, processing many beasts for braaiing. “We’re even going to auction off a sheepdog,” somebody told me. They promised to be open for business the following week. We scrabbled about in our trusty padkos box and made do with in-car provisions to tide us over. Strandfontein, out of season, was devoid of life. But it was buzzing over at Doring Bay, especially around the Fryer’s Cove corner by the old crayfish factory. There was even a lighthouse to rest our romantic eyes on. Fish and chips, chilled Sauvignon Blanc, good company, a walk on a long pier and now we were wishing we’d booked in somewhere local for the night. We turned down the second bottle of wine and drove back to Calvinia, in time for dinner at the Hantam Huis. Alta Coetzee and her husband Erwin fed us bobotie, waterblommetjie bredie and lamb pie in generous portions. We rolled back to our cottage. Jigging up a storm at the Williston Winter Festival. 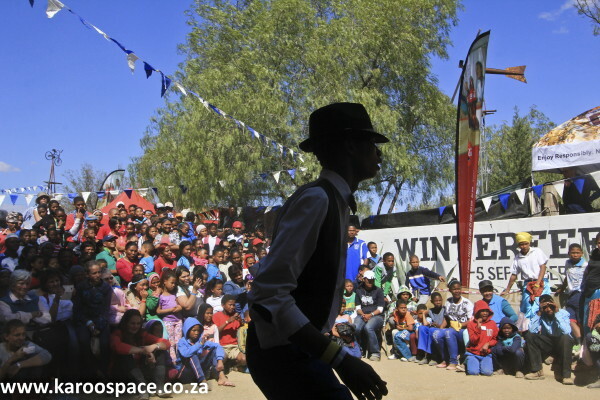 Come Saturday morning, and our assignment for the day was the Williston Winter Festival about 140km back east on the R27. This is an event you have to attend, at least once in your life. It’s not a festival like you or I are used to, packed with sokkiejol singers and pizza boats. No, this is a Nama Riel party, celebrating the dance culture of a lively local community. We pitched up as the deejay was lugubriously informing a clutch of young boys about Stink Bomb Protocol. The lamb sosaties were a runaway hit. As was the head-spraying corner, in aid of CANSA. We bumped into the rampant Van Rensburgs and Dirk made Walter and me have our balding heads dyed for the cause. 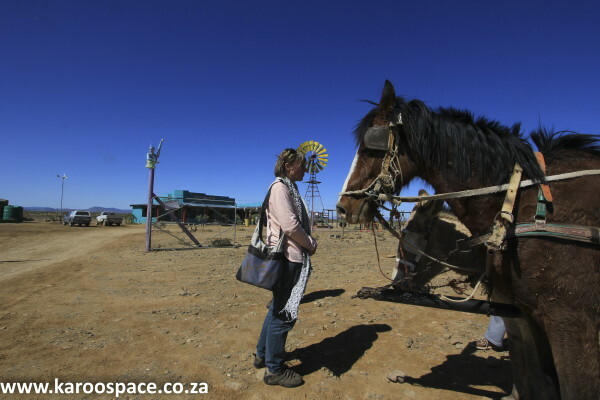 We drank far too much Namaqua wine, so our friend Magrieta Botha hitched her donkeys (Sahara and Kleinveld) and carted us about the village for a sobering 30 minutes. Then the dances, oh the dances. And the tie-dyed shirts. And some more Namaqua wine. And we all realised this was the place to be, every spring, for the remainder of our lives. High kicks and high spirits at the Williston Winter Festival. Tankwa Padstal: wlange@breede.co.za or hlange@breede.co.za – they also have a Facebook page, which is the best way to speak to Wally Lange. Closed on Wednesdays. If you arrive at the Fred Turner Museum in Loeriesfontein and it’s closed, there is a list of local numbers at the entrance. Phone one of the numbers and someone will come down and open up for you. The Williston Mall and the Williston Winter Festival both have Facebook pages. Snow Time in the Eastern Cape Karoo! Fantastic article with wowzer photos. Thank you.